This one’s for all the interns starting this month. My internship-assigned mentor gave me a bulleted list of things that HAVE to get discussed in a first therapy session (left side of the page), and some talking points to bring up if the conversation is difficult to keep flowing (right side of the page). Naturally, I made myself a sketchnote version of her list between clients. I converted to sketchnote form not just for fun- but because I’ve learned that’s the best way to work with my visual– based brain. For me, when I remember information, I recall it in the visual form in which it was remembered. If I try to remember a bulleted list, I remember only the appearance of the list. 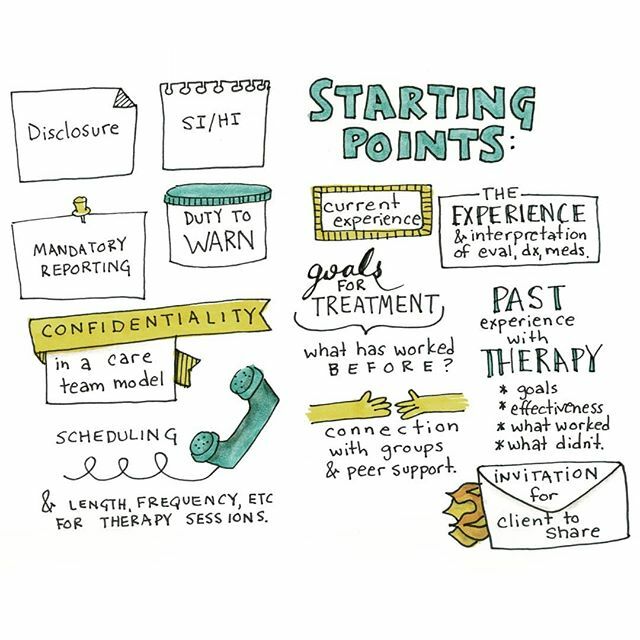 Creating a visual format, like this list of starting points for therapists conducting a first session with a new client, helps me connection visual memory with content.